Being my second visit to Marrakech this year, I made sure to plan it perfectly. Morroco was planned as the middle leg to my the primarily UK and Ireland trip booked for a friends wedding. With summer not having been over yet, I knew I was going to need some warm weather. Morocco enticed me as the perfect in-between destination breaking up the somewhat chilly stay in the UK and Ireland. 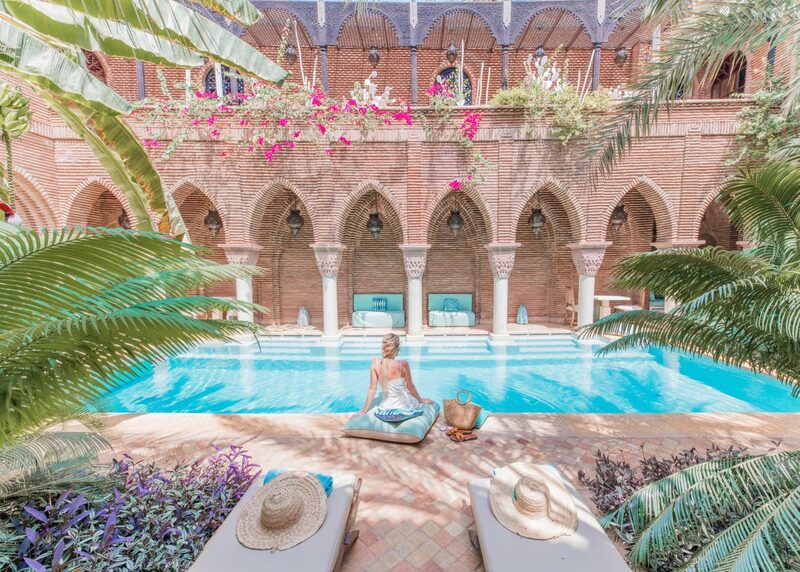 Knowing the preceding week would be full of late nights and flowing Guinness, I wanted my time in Marrakech to be a balance of pampered relaxation, adventure, and culture. I perfectly planned for just that. My trip to Marrakech began with a 5:30am flight leaving London. I would typically consider myself a morning person, however, I am so not good with early morning flights. 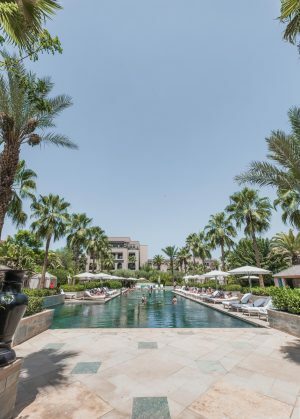 Knowing my arrival to Marrakech would require a bit of relaxation, I booked a day with the Four Seasons Marrakech. FS was the best place to settle into Marrakech before we head out to our first adventure. Although short, my day at the Four Seasons Marrakech couldn’t have been more pleasing. From the moment we arrived, we were regretful for not booking a longer stay. However, we were glad we made the stop to experience the exquisite resort. Originally planning for a day of lunch and lounging by the pool, our plans quickly turned course when we arrived to scorching 40-degree weather. Typically adept to handle this kind of heat, our few days prior in London were only a brisk 10-15 C, this made the hot Moroccan temperatures more of a shock. We maintained the plans to enjoy lunch by the pool but were quick to switch up the poolside relaxing time to enjoy their lovely, air-conditioned spa instead. After a quick tour of the property, (see highlight here) we had a delicious lunch next to the pool. 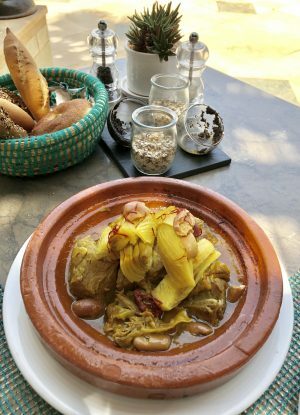 I ordered the first tagine of my Moroccan trip and the first I was able to have since developing a craving following my last trip to Morocco. If you haven’t heard of a tagine, it is the signature dish of Morocco. The dish, named after the clay pot it is cooked in, is typically slow-cooked lamb or beef in a tasty sauce. It is somewhat stew-like and usually accompanied by vegetables and a side of couscous. VERY delicious! Following lunch, we moseyed our way over to the spa to relax before our 4 pm departure. 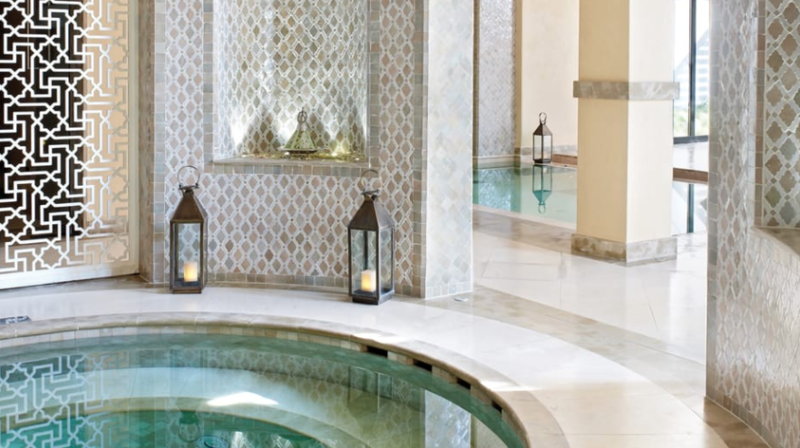 The Four Seasons Marrakech spa is wonderfully laid out with a beautiful Moroccan design. The space is filled with natural light and a soothing blue toned ambiance. The spa has various treatments, including the traditional Moroccan Hammam – a steam bath with a full-body scrub and facial. The facility also features a plunge pool, sauna, steam room, and an outdoor relaxing space. One treatment I wish I had indulged in was their Argan Oil massage. Being only offered in Morocco, this would have made for a nice experience – more reason to return! Before our 4pm pickup, we met our friends in the lounge and enjoyed a few cocktails before heading off to our desert adventure. Overall our day with Four Seasons Marrakech was wonderful and we hope to visit again soon. Next time we’ll enjoy a longer stay! 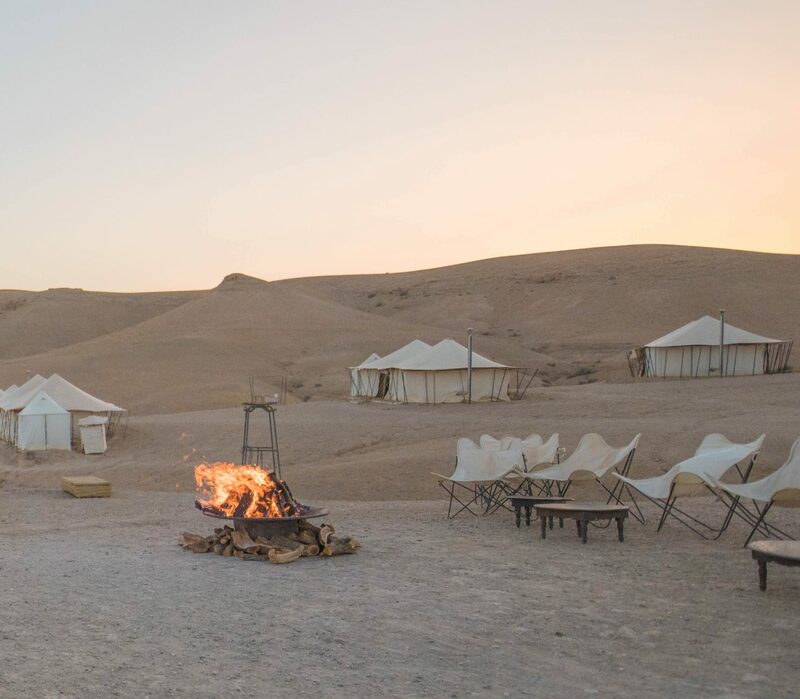 After spending a day with the lovely Four Seasons, our driver arrived to take us to the famous luxury desert camp – Scarabeo Camp. Having visited earlier in April, I was super excited to return and experience this one-of-a-kind camp once again. 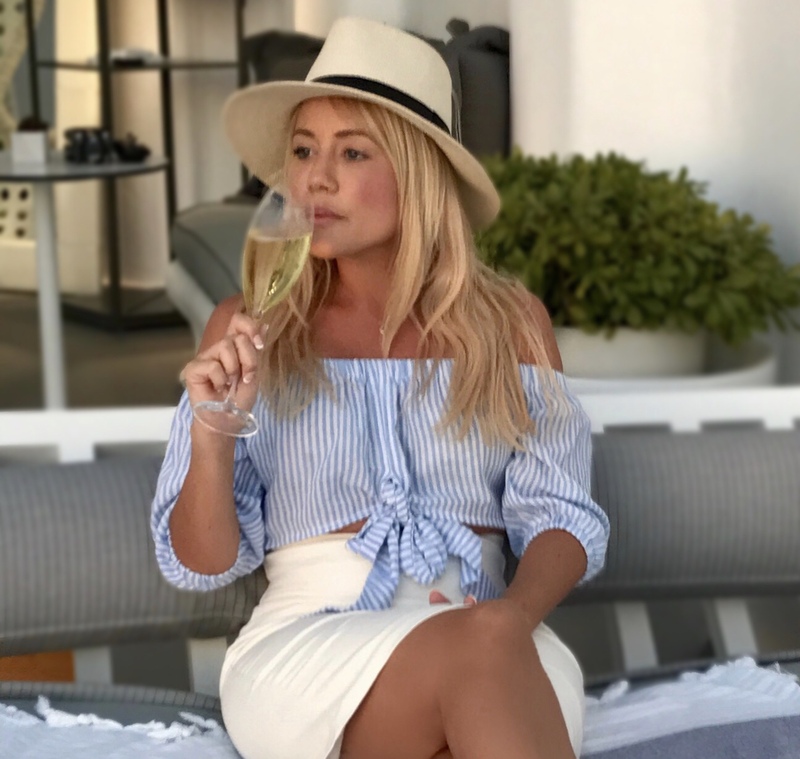 I had such a fun girls weekend in April, with fellow bloggers, @todayshetravels, and @grabyourbagsnl and just had to come back. This time bringing my husband and our two friends. The drive to the camp is a quick 40 minutes from the Marrakech city center. Upon arrival, I couldn’t believe my eyes. The entire landscape had transformed from what was a green covered terrain with a mountainous backdrop in April, to a now barren desert land (see April vs. August). Because of the huge transformation caused by the seasons, it was almost as if I was arriving for the first time myself. Being 40 degrees that day, it was scorching hot. As we sat down for our welcome tea and snacks, we joked how we weren’t going to be able to survive the night. As the night progressed, the weather, fortunately, did cool off. During our evening we explored the camp, hung out with the camels and really bonded with the lack of WiFi. (FYI: no WiFi) We were also entertained by the camp staff who told us how we had just arrived following Madonna 60th Birthday Bash. We thought it was pretty cool to be the first guests after the likes of Madonna and her special guests including Beyoncé. At 8:30 pm dinner was served and not to my surprise, it was Tagine again! This time with a delicious beef and pear. The food served at the camp is always delicious! As the sun went completely down, it began to get cool. With the lack of humidity, the heat doesn’t really stay in the air so the guests huddled by fire before heading to bed. Contrary to what we thought, sleeping in the tent ended up being quite comfortable with the cooled off temps. We even had to use the blankets they provide to keep warm. With the early morning we had had traveling in from London, we head to bed at 1030pm and slept like babies. There is nothing quite like a sunrise in the desert. This time was distinctly different from the last in April, as the morning air had a thick haze to it. I woke up at 630am sharp to catch it. The sun rose with a very golden hue and you could feel the heat as it rose. I quickly ran up to the vantage point at the entry of the camp to get the epic morning view. After taking several photos, we head back down the hill to have breakfast. Breakfast is a light meal with eggs and fresh Moroccan bread served with yogurt and jams. It is the perfect light bite to begin the day. After we finished with breakfast, we head back to the tent to get ready for the day and packed up the rest of our belongings for our 1030am pickup. The experience was wonderful yet again and left us wishing we had stayed for just one more night. 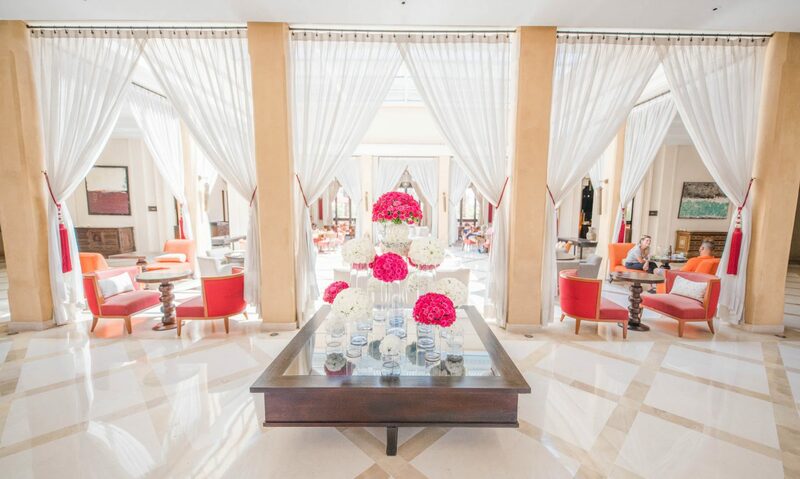 The next stop, aptly planned after a night outdoors, was the ultra-luxurious Mandarin Oriental property in Marrakech. About 40 minutes from the camp, the Mandarin Oriental sits just outside of the busy Marrakech Medina. 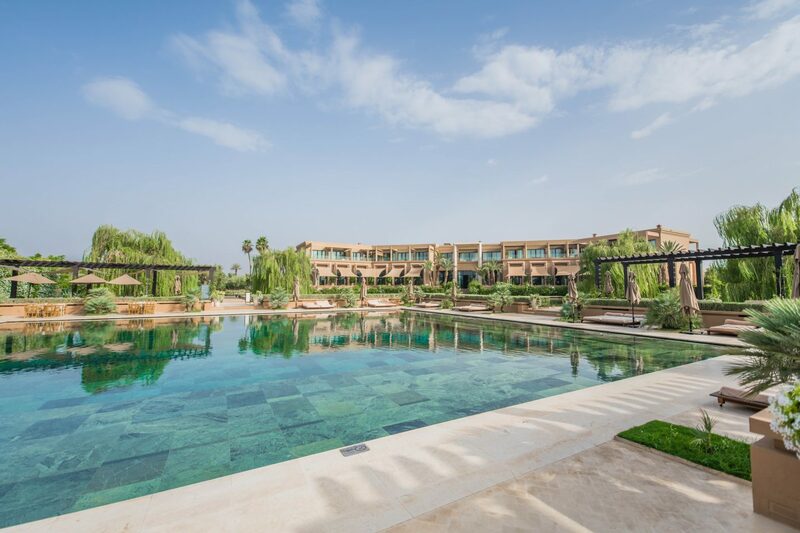 Set on almost 20 hectares of beautifully cultivated land, the Mandarin Oriental is the pinnacle of luxury resorts in Marrakech. Upon arrival, we were immediately in awe of the strikingly beautiful architecture and lush landscape. It quickly proved to be the perfect choice after our night out under the stars. While we waited for our villas to be ready, we toured around the resort admiring the perfect symmetry and precision and in the arabesque layout. Everything is structured perfectly geometrically throughout the entire property. I had really wished I had been able to bring my drone to see the view from above. Being another sweltering day, we ended the tour by hanging out by the pool while we waited to check into our villas. Oh my goodness, was this ever a treat. After an hour or so by the pool, enjoying their delicious detox cocktails, we were able to check into our villas. Our first impression when the doors opened was that we couldn’t believe the size – it felt like walking in to our very own riad! At 4,000 SqFt of living space, the villa is vast with both indoor and private outdoor space. 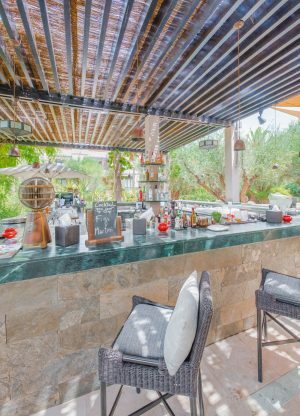 The large outdoor area includes a sizeable pool and hot tub, sun loungers, sofas and dining space, a wet bar/kitchenette and finally an outdoor garden shower. The interior is equally spacious with a perfectly functional layout. 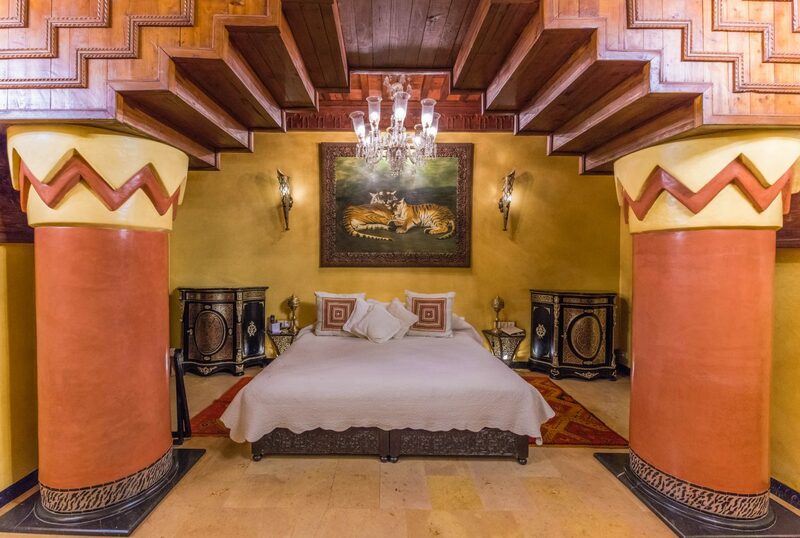 The king bedroom is in the center of the space with sliding doors opening up to the hot tub. There is a large lounge space on one side, with a desk, television and plenty of cozy seating and finally a spacious bathroom on the opposite side with a lounger, bathtub and steam shower. After spending the remainder of the day in the villa and ordering a larger-than-life lunch, we decided that it was finally time to see more of the resort. We freshened up to meet out friends at their on-site Hakkasan restaurant and cocktail bar, Ling Ling. The ambiance was great and the food/cocktails even better – it was truly a wonderful evening spent at Ling Ling. The next two days were spent with the utmost relaxation imaginable. Time was non-linear as we hung out in the villa, roamed around the resort and truly enjoyed the pampered treatment by the lovely MO staff. Our restful stay had us ready and prepped to take on the exhilaration of what the last leg of our trip would bring. With the intention of finishing the trip immersed in the hustle and bustle of the Medina, we made our way over to one of the top luxurious riads in Marrakech, La Sultana. Keeping at par with the rest of the week, La Sultana couldn’t have been a more perfect fit for the luxury theme. 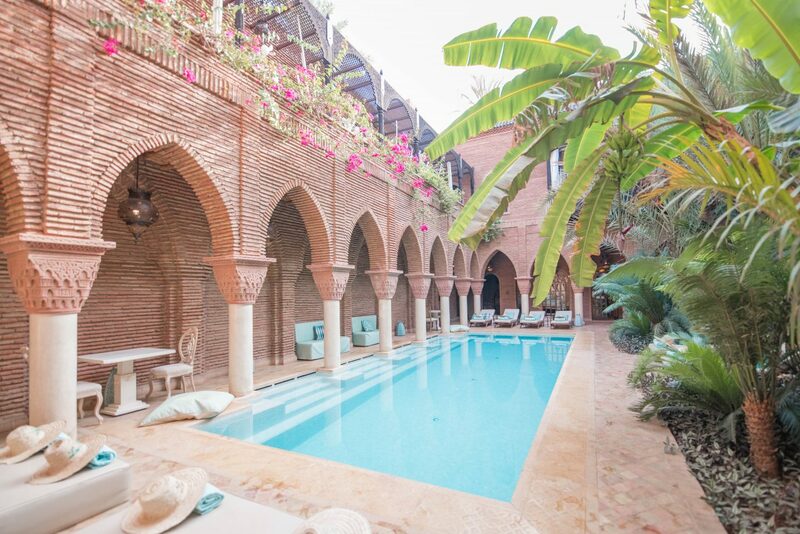 La Sultana is located on a quiet side street right in the Marrakech Medina. In about a 5 minute walk, you will be in the center of the busy Medina square. 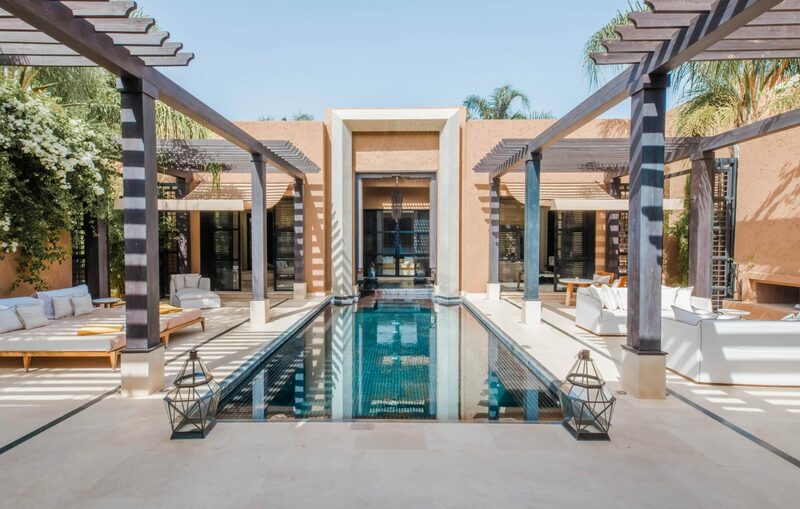 Combining 4 luxurious riads into one, the La Sultana property is quite large. They have 28 distinctly unique suites, 4 courtyards each with their own lounging space, a large hammam spa and lastly, an enormous rooftop complete with a restaurant and bar. 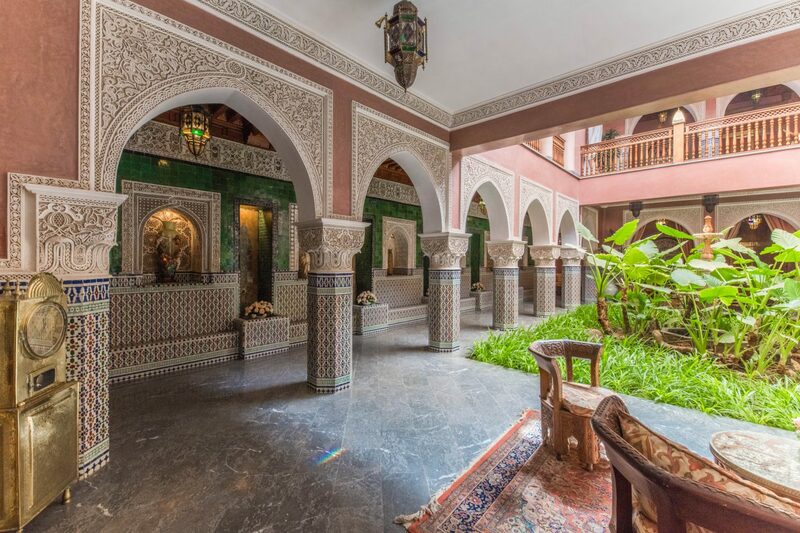 Being a guest here felt like you were the king and queen of your very own Moroccan palace. It was fairly occupied while we visited, however, because of the large property and separated areas, you wouldn’t have been able to tell. It felt very exclusive. We sat down for a quick bite before checking into our rooms. The menu is very good and also quite exotic, should a camel burger be on your mind, they’ve got you covered. My friend ordered the camel burger and we couldn’t believe how similar it tasted to beef! Our suite, or rather I would call it our palace bedroom with an en suite, was fairly large and fully ornate in tiger decore. I loved the African motif and the exoitic yet luxurious feel. The rooms all entered into the courtyard of the riad they were located in, ours was. Sleeping here was blissful. Since the interior rooms had no windows except for thoes into the courtyard, the rooms became pitch black during the night and into the morning. Usually being someone who wakes up with the sunrise, this was a bit of a different experience for me and I happened to really enjoy it. Staying in the city makes for a vastly different experience than in a resort. The last thing you want to do is stay indoors when you have a vibrant city outside your door. I usually find that it’s tough to find balance to enjoy the best of both when staying in luxury accomodations. On our day of arrival, we made the mistake of touring through the medina in the scorching heat. We returned back to the riad drenched in sweat and quickly realized that the August heat in Marrakech was unbearable. It made it easy to maximize the riad experience and stay somewhat sheltered from the heat. With that, we decided we would stay at the riad in the day and explore as the sun set. During the hot days, we hung out by the pool enjoying the vibes and cooling off with a dip. Once the sun began to set, we ventured out into the medina for some late afternoon excitement. It seemed to us that the locals had the same idea. The Medina lit up at night and was a true cultural experience. A week in Marrakech is perfect. There is a lot to see and do and many different experiences to be had. 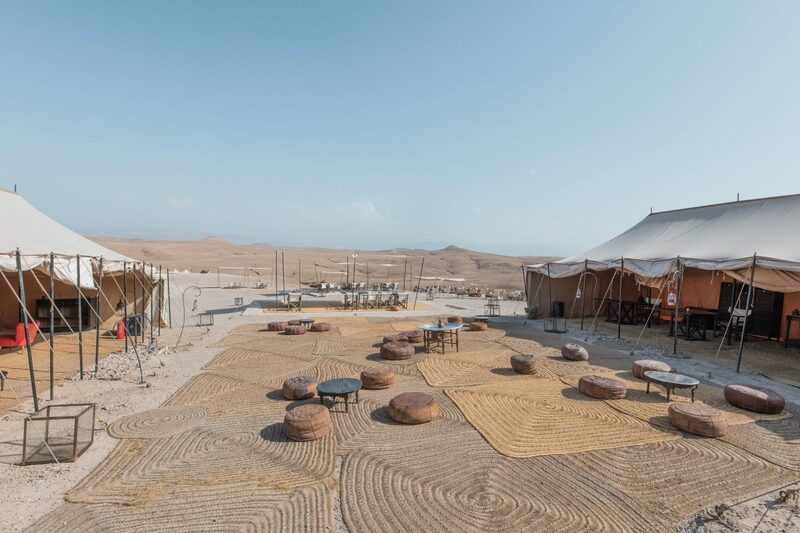 In a week’s, time you’ll be able to experience Moroccan culture, adventure and relaxation all in one. My best advice is to mix it up and enjoy all there is to offer. Make sure to combine some time in the medina with a relaxing stay at a nearby resort or camp. And if you can swing it to do all three, you’ll experience the perfect trifecta for a memorable Moroccan vacation. Should you be in Marrakech for longer, you may even have time to visit other nearby areas. The Atlas mountains, the Sahara, and nearby towns of Ouarzazate or Essaouira would all be excellent choices. All are within a reasonable driving distance and offered by many tour operators. Whatever you choose is sure to be an incredible experience. Morocco is an awesome destination with so much to do, see and explore. I had an amazing time twice this year and I am sure you will too! Heading to Morocco? Make sure to drop me a line below! I’m heading to Marrakesh next week and was hoping to have a similar stay. I’m staying at Scarabeo too and then the Four Seasons. Thanks for this! WOW!!! This place is high on my list for next year!!! That camp looks so cool I would love to stay there. I’ll keep this post in mind when I visit!